Market Square Transfer Center — Market St. at 5th St.
Start off your visit on the 11th (Tue): see a show at Grand Ole Opry, then appreciate the extensive heritage of Downtown Franklin, and then take an in-depth tour of Lotz House Museum. To see ratings, traveler tips, maps, and tourist information, read Nashville tour planner . Mumbai, India to Nashville is an approximately 22.5-hour flight. The time zone changes from India Standard Time to Central Standard Time, which is usually a -11 hour difference. Traveling from Mumbai in June, plan for a bit cooler nights in Nashville, with lows around 22°C. Cap off your sightseeing on the 11th (Tue) early enough to travel to Columbia. On the 12th (Wed), look for all kinds of wild species at Saluda Shoals Park and then meet the residents at Riverbanks Zoo and Botanical Garden. To see more things to do, ratings, maps, and more tourist information, use the Columbia trip itinerary planner . You can fly from Nashville to Columbia in 5 hours. Alternatively, you can drive; or take a bus. The time zone difference when traveling from Nashville to Columbia is 1 hour. In June, daytime highs in Columbia are 38°C, while nighttime lows are 25°C. Wrap up your sightseeing on the 12th (Wed) early enough to travel to Key West. Do some cultural sightseeing at Audubon House & Tropical Gardens and Truman Little White House. Your itinerary includes some good beach time at Bahia Honda State Park and Sombrero Beach. There's lots more to do: identify plant and animal life at Fun In The Sun Key West, look for gifts at Isle Cook Key West, explore the different monuments and memorials at Key West Cemetery, and take a tour by water with Boat Tours & Water Sports. To see ratings, photos, more things to do, and more tourist information, go to the Key West trip maker . Traveling by flight from Columbia to Key West takes 5.5 hours. Alternatively, you can do a combination of bus and flight; or drive. Traveling from Columbia in June, you can expect nighttime temperatures to be a bit warmer in Key West, with lows of 30°C. Finish your sightseeing early on the 15th (Sat) so you can travel to Miami. Kick off your visit on the 16th (Sun): take a stroll through Lincoln Road and then get a taste of the local shopping with Aventura Mall. Here are some ideas for day two: buy something for everyone on your list at Village of Merrick Park, then browse the different shops at Dolphin Mall, and then enjoy the sand and surf at South Beach. For where to stay, reviews, ratings, and tourist information, go to the Miami day trip planner. Traveling by flight from Key West to Miami takes 2.5 hours. Alternatively, you can do a combination of flight and bus; or drive. In June, daytime highs in Miami are 37°C, while nighttime lows are 29°C. Finish up your sightseeing early on the 17th (Mon) so you can go by car to Miami Beach. 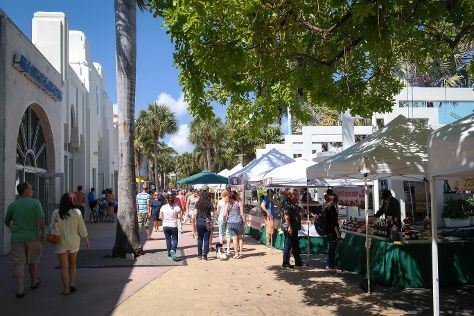 On the 18th (Tue), enjoy the sand and surf at South Beach, get to know the fascinating history of Art Deco Historic District, then take a stroll through Lincoln Road, and finally wander the streets of Collins Avenue. Here are some ideas for day two: appreciate the extensive heritage of Art Deco Tours, get a taste of the local shopping with Bal Harbour Shops, and then kick back and relax at Haulover Beach Park. To see where to stay, traveler tips, photos, and more tourist information, you can read our Miami Beach trip builder site . Miami Beach is very close to Miami. June in Miami Beach sees daily highs of 37°C and lows of 29°C at night. Wrap up your sightseeing on the 19th (Wed) early enough to drive to Orlando. Explore Orlando's surroundings by going to St. Barnabas Episcopal Church (in DeLand) and Andy Romano Beachfront Park (in Ormond Beach). Pack the 20th (Thu) with family-friendly diversions at Universal's Islands of Adventure. Pack the 22nd (Sat) with family-friendly diversions at Walt Disney World Resort. It doesn't end there: discover the magic at Happily Ever After Fireworks. For traveler tips, more things to do, ratings, and more tourist information, refer to the Orlando online road trip planner . Traveling by car from Miami Beach to Orlando takes 4 hours. Alternatively, you can take a bus; or do a combination of bus and train. In June, plan for daily highs up to 38°C, and evening lows to 26°C. Finish your sightseeing early on the 22nd (Sat) to allow enough time to travel to Gettysburg. Start off your visit on the 23rd (Sun): contemplate the long history of Eisenhower National Historic Site, then admire all the interesting features of Gettysburg National Military Park, then take in the dramatic natural features at Devils Den, and finally steep yourself in history at Little Round Top. Get ready for a full day of sightseeing on the next day: explore the different monuments and memorials at Gettysburg National Cemetery, get your game on at Victorian Photography Studio, do a tasting at Knob Hall Winery, then look for gifts at The Lion Potter of Gettysburg, then witness the site of a historic battle at Association of Licensed Battlefield Guides, and finally get engrossed in the history at Gettysburg Museum & Visitor Center. For reviews, traveler tips, other places to visit, and tourist information, read Gettysburg trip itinerary planner. Getting from Orlando to Gettysburg by combination of train, taxi, and flight takes about 5 hours. Other options: drive; or do a combination of train and bus. In June, Gettysburg is a bit cooler than Orlando - with highs of 32°C and lows of 19°C. Wrap up your sightseeing on the 24th (Mon) early enough to drive to Washington DC. Do some cultural sightseeing at Washington National Cathedral and National Gallery of Art. Take a break from the city and head to Tidal Basin and National Zoological Park. There's much more to do: see the interesting displays at National Air and Space Museum, learn more about the world around you at Smithsonian National Museum of Natural History, contemplate the long history of Arlington National Cemetery, and take an in-depth tour of United States Holocaust Memorial Museum. To find where to stay, ratings, maps, and other tourist information, read our Washington DC trip planner . You can drive from Gettysburg to Washington DC in 2 hours. Other options are to do a combination of taxi and train; or do a combination of taxi, flight, and train. Traveling from Gettysburg in June, plan for a bit warmer nights in Washington DC, with lows around 24°C. Cap off your sightseeing on the 27th (Thu) early enough to catch the train to Philadelphia. Your inner history buff will appreciate Independence Hall and Powel House. Get some cultural insight at Rittenhouse Square and Elfreth's Alley. Explore the numerous day-trip ideas around Philadelphia: Longwood Gardens (in Kennett Square) and Valley Forge National Historical Park (in Valley Forge). There's much more to do: hunt for treasures at Reading Terminal Market, get to know the fascinating history of Independence National Historical Park, admire nature's wide array of creatures at Philadelphia Zoo, and wander the streets of Society Hill. To see more things to do, ratings, traveler tips, and other tourist information, go to the Philadelphia trip itinerary planner . Getting from Washington DC to Philadelphia by train takes about 2 hours. Other options: drive; or take a bus. June in Philadelphia sees daily highs of 34°C and lows of 21°C at night. Cap off your sightseeing on the 30th (Sun) early enough to travel to North Wildwood. North Wildwood is a city located on the Jersey Shore in Cape May County, New Jersey, United States. On the 1st (Mon), enjoy the sand and surf at Sunset Beach and then kick back and relax at Ventnor City Beach. Get ready for a full day of sightseeing on the 2nd (Tue): look for gifts at West End Garage, then enjoy the sand and surf at Cape May City Beaches, and then enjoy the sand and surf at North Wildwood Beach. For ratings, reviews, maps, and other tourist information, read North Wildwood trip planner . Traveling by car from Philadelphia to North Wildwood takes 2 hours. When traveling from Philadelphia in June, plan for slightly colder days in North Wildwood, with highs around 30°C, while nights are about the same with lows around 20°C. Finish your sightseeing early on the 2nd (Tue) to allow enough time to travel to New York City. For shopping fun, head to Fifth Avenue or The Strand Bookstore. 9/11 Memorial and St. Patrick's Cathedral will appeal to history buffs. There's much more to do: explore the galleries of The Metropolitan Museum of Art, stop by Tiffany & Co., take a stroll through Times Square, and don't miss a visit to Statue of Liberty National Monument. For photos, traveler tips, reviews, and other tourist information, you can read our New York City trip itinerary planning app . Drive from North Wildwood to New York City in 3 hours. Expect a daytime high around 35°C in July, and nighttime lows around 26°C. Wrap up your sightseeing by early afternoon on the 8th (Mon) to allow time for travel back home.